Mark Twain said that if he’d had more time, he would have said less. Quite a self-reflection don’t you think? Do you ever reflect this way on your own life? We do tend to be our own worst critic. Our own self-feedback may not always be the healthiest. The truth is, we may not be great at receiving feedback from others either. We call it constructive criticism but often that’s just the veil of judgment. Even so, feedback is important if we’re going to grow, change, shift, adapt, improve, succeed. In many ways, we’ve become oversensitive to receiving feedback. Representative-elect, Dan Crenshaw, of the 2nd District in Texas and former Navy Seal officer, lost his right eye to an improvised explosive device while serving our country. He continued to serve even after that injury. Most recently he was mocked on Saturday Night Live as Pete Davidson made fun of several politicians. Many were outraged. Crenshaw, a Navy Seal who had experienced the chaos and injury (of all kinds) of war had been through harder things than a comic’s mockery. 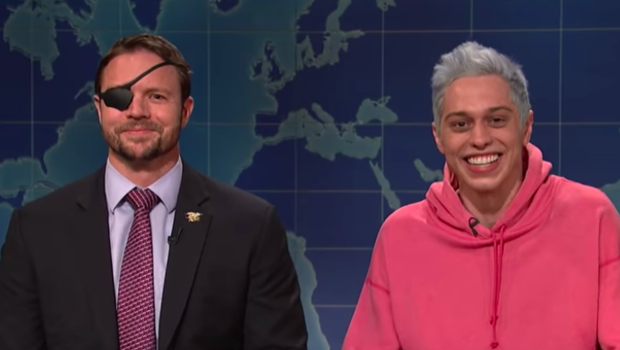 Crenshaw was invited onto SNL the following week where he and Davidson did a bit together, bridging the difference in a light-hearted way, honoring veterans who have served faithfully and sharing a need to forgive, heal and move forward together. Crenshaw said, “I try hard not to offend others and try even harder not to be offended.” Not bad advice and maybe some helpful feedback for you and me to remember. Feedback. Are you up for some today? This sort of advice may be what you first think of when it comes to feedback. Certainly, as we in the throes of this Open Mic series, feedback has a technological connotation. If you get a microphone turned up too loud or in front of the wrong speaker or amplifier, a deafening screech has been known to be sounded. A ‘hot mic’ we might say when that ear-piercing sound is made. Nothing pleasant about it whatsoever. But we’re not really talking about that kind of feedback today either though we are playing on that idea given the nature of our series. Instead, I’m taking some liberties with the two words that are the basis of the word feedback. Feed and back. In this series on gratitude, I’m wondering how we’ve been fed – our minds, our stomachs, our souls – and how, in turn, we might feed back. With the gratitude for all we are, all we’ve experienced, all we have, how will we feed back – how might we give back to God, to our neighbors, to the church? Someone surely comes to mind when you think of a person who has done this well, faithfully, with deep gratitude. Our own Mary Magee, member of our Stewardship Team responsible for this current series and campaign, described those generous people in a beautiful way. She said, “They opened their hearts to help others and they helped others to open their hearts.” That’s this feeding back we’re hoping to embody as people of faith. The Apostle Paul had the same hopes for the early churches he helped start. What an exciting season in the life of the church. Talk about grass-roots. Jesus is resurrected and now it’s game on. Life was forever different and the likes of Paul stepped into the role of church planter, ministry entrepreneur, creator of the community of faith designed to contain the hopes of the world. The passage from Acts that is our focus today is Paul’s farewell to many he nurtured along the way. These were people with whom he shed blood, sweat, and tears for the sake of the Gospel. They believed in it so. They were moved by Jesus. They were committed to the cause. And they gave everything they had to propel the church into the future. Paul knew the infection of the world was not far away. He lived among the pain every day. Through the entire motif of this pericope from Acts, runs this dominant feeling of an affection as deep as the heart itself. That feeling should be in every church for when love dies in any church the work of Christ cannot do other than wither. Paul departs. He is grateful for what he’s shared with that Christian community, but his course is forward. He’s got to share forward that gratitude with more who are seeking faith. He must keep feeding back. What is your course forward? How are you feeding back, giving of yourself to the faith that has given you new life? Are you giving forward? A friend said to me this week, “I always prayed I could live well enough until my kids were adults. But then I made it and realized I couldn’t stop there. Now I’ve got grandkids to care about.” In this life of faith, there is no end-game. It’s the course. The journey. The faithful next step to a new view where the next faithful step can be seen more clearly. This is Paul’s sentiment – “I do not count my life of any value to myself, if only I may finish my course and the ministry that I received from the Lord… to testify to the good news of God’s grace.” When you find that truest meaning of your life… that deepest conviction of your purpose… it must lead you forward. And such a path can only be taken with gratitude. Are you on such a path? Much of the time we are either distracted by the chaos around us or unintentional in our attention to God’s guidance. But don’t give up when you can’t feel it on the inside. Daniel Grothe noted this about the long journey we’re on. “The life of faith is the life where the saints learn to play the long game with each other. If we do it right,” he says, “the seasons of bottoming out in grief and overwhelming despair do not have to be seen as final but can be seen as stops along the way.” The biblical greats wobbled and fell and had moments of complacency, but they didn’t stay there. They rose. They re-focused. They saw the course forward – and typically only when they remembered gratitude; when they recalled where they had been and who Christ had become for them. They couldn’t help themselves but to press forward and give faithfully. They opened their hearts to help others and then helped others to open their hearts. Isn’t this what we are about as a church family? I don’t know about you, but I hear a lot of stories from the world that are designed to discourage us. They are designed to create fear and a push to create an isolated life where you’re skeptical of your neighbor and always bowl alone. But then I speak to you… I run into you… I meet with you… I pray with you… I give of my time and talent and resource alongside of you and a wholly other life story emerges. A life with pain, sure, but a life that is pushing forward with purpose; a life that is singing a song that is worth getting stuck in your soul. Can you hear that soul song now? Is it in you? It’s glorious. It’s glorious, in part, because of the pain. In his memoir What I Talk About When I Talk About Running, the Japanese writer Haruki Murakami reflects on why runners spend so much time and energy on long distance runs like some of our folks running the Route 66 Marathon downtown right now. He says, “It’s precisely because of the pain, precisely because we want to overcome that pain, that we can get a feeling, through this process, of really being alive.” Paul was surely a runner – he used race imagery so often. But he knew he had to keep running. He couldn’t rest on his laurels. He couldn’t grow complacent. He was only really alive when he was gratefully living out the call on his life. It’s Thanksgiving Sunday. We’re counting blessings and living gratitude. I’m grateful for all who will make a pledge today to support the ministry we’ll share in 2019. May our gifts be sign and symbol of our gratitude and our clarity of course – that we are pressing forward together, not out of obligation, but out of faith… out of commitment to the long game of the saints. It speaks to the words of the Persian poet, Hafiz, who said, “Even after all this time, the sun never says to the Earth, “You owe me.” Look what happens with a love like that. It lights the whole sky.” We have opportunity day after day, year after year to show the world what a grateful love like that can do. We can light up the whole sky… the entirety of the earth… with the glory of Christ. Your gifts matter. So do mine. It’s our feed back… our gifts forward. This is our time for we never know what time we have. Kirk Cousins is the quarterback of the Minnesota Vikings. In front of his home, in between a few shrubs, stands a curious tower. 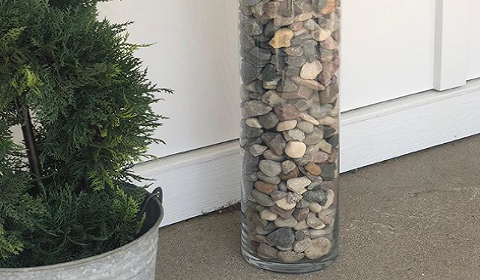 It’s about four feet tall, filled to the top with stones. Inspired décor you ask? Well… sort of. “It’s there,” he says, “to remind me how brief life is and how important the time we have here is.” Okay. But why the tower of stones? “It’s a little morbid,” he admits, “but it’s a tool my Bible teacher taught me in high school.” The stones were inspired by the Psalm his teacher shared with him that says, “Teach us to number our days that we may gain a heart of wisdom.” Cousins said, “It’s about making a deposit in people’s lives in a way that matters.” We only have so many days. The quarterback transformed that verse into a visual reminder: 720 stones. He calculated what he considered a feasible number of years he had left given his health and history, measured that time in months and came up with 720 months left in his life Lord willing. “Every month I’m going to take out a stone,” he said, “put it in my pocket and think: ‘Once this month is over, this is gone. You can’t get it back.’” Cousins was going to be intentional about how he spent the time he had left… wanting to stay the course of his faith, his call to live generously, in pursuit of his life’s purpose. Carrying each stone reminds him to be less selfish and more giving to others because, in the end, he says, “It’s not going to be about what I did for myself, but what I did for others.” So he pulls a stone and he asks the question, “What impact am I making, not only today, but for eternity?” This was Paul’s waking question. And so, my friends… what is your waking question? Does it have anything to do with feeding back; about giving forward? It’s worth a thought. It fact, it’s worth more than a thought. It’s worth a life… lived open before God… free to pursue the dream of your calling in Christ. Which leads us to finish with the same question that started this whole series in the first place. 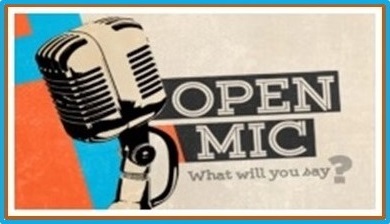 Your life is an Open Mic… what will you say? This piece was shared in Rob Bell’s “Drops Like Stars.” Harper One. 2009. Pg. 46. Check … 1. 2. 3. If you’re happy and you know it clap your hands. If you’re happy and you know it clap your hands. If you’re happy and you know it then your face will surely show it. If you’re happy and you know it, clap your hands. Well… okay then. Wasn’t sure how that would go. We have some happy people in the house today. We have some who maybe just humored the pastor and went along with the child-like experiment. There may be a few of us who had no familiarity with the song and by the time we caught on it was over. We have some who likely flat out refused – “I don’t participate in ridiculous clapping rituals.” And honestly, it’s all okay. In fact, I learned this week that whether we’re happy and we know it or not may be something we can’t fully control. I’ve been reading some of Dr. Robert Emmons work in preparation for this series on gratitude. Dr. Emmons is considered one of the top scientific experts on gratitude which is fascinating – the science of gratitude – have you ever thought about gratitude as a science? Emmons notes that each person has a chronic or characteristic level of happiness. The research suggests that “people have happiness set-points to which they inevitably return following disruptive life events. Getting that book published, moving to California, having the person of your dreams answer your personal ad, each of these may send the happiness meter right off the scale for a while but, in a few months, it will drift back to the set-point that is typical for that individual. What goes up must come down.” Interesting. It makes sense when you think about people in your life. Some have a naturally happy disposition and others have been waking up on the grumpy side of the bed for a while it seems. It’s a process of adaptation. Humans are adaptation machines. We take good things for granted and overcome obstacles that life throws our way only to return to the state of happiness that is natural for us. You win the lottery? A couple months later, you come down from the high to your happiness set-point. You lose a job? A few months later, you re-settle into that natural set point. I was honestly a little discouraged by this; as if there is nothing we can do about it. To strengthen this idea, Emmons says that 50% of our happiness is determined by our genetics. Why does this matter? Because I want you to be happy? Of course, I do. But I also want us all to be growing in our spiritual health. It is why we are focused on gratitude this month. Practicing gratitude seems to be more than a good idea – but a reality of spiritual health. So, we’re tackling this honestly in this series called Open Mic. Andy McMillan stepped to the Open Mic today to share his thoughts on gratitude and stewardship… it is always inspiring to hear our community speak up about these matters. And we’re asking all of us to consider our own lives as an Open Mic. You have a voice. You practice a set of behaviors. You have influence in your home or your place of work or in the circles of friends and people you move among every day. What kind of impact are you making in those places? What is your life saying to them? And why does it matter as a person of faith? We’re asking these important questions in this stewardship series even as we’re asking us to consider the nature of gratitude and how, in turn, we give of our time, talents, and resources to God. Today’s title: Open Mic: Check one, two, three. As a kid, there was nothing more fun than finding an open mic… you could make weird noises or yell loudly or beat box… it was just fascinating to hear your voice amplified. Being a pastor’s kid, I often was around the church early (and late), before and after events would happen in the life of the church. The sound guy would often send me up on the chancel before events and check the mics. Loved it. “Mic check, one, two, three,” was the standard and I usually started with that before broadly expanding what I would test out on the microphones. There was an old rap song from those days that included the line, “You better check yourself before you wreck yourself.” It was actually more like, “Chick-chiggidy- check yo’self before you wreck yo’self.” It was always worth a go when checking the mics. And while I can’t remember even a little bit of the rest of the song, that line has staying power. It would heed a good warning to my spirit in times of need. It was like the parental advice before going out, “Remember who you are.” Same thing. Check yourself before you wreck yourself. You can get yourself in a bind pretty quickly if you’re not intentional about what you expect your life to be about. There is plenty of scripture that can be of help in times of need but there’s nothing quite like the Proverbs to put you in check when you need it the most. Some have described the Proverbs as the voice of that wise elderly person in your life who has been through it all and doesn’t have time to sugarcoat advice any more. The Proverbs cut to the chase. Get right after what’s real and necessary and what can alter your behavior in a positive way. The two short verses from Proverbs 11:24-25 get right to the point. “Some give freely yet grow all the richer; others withhold what is due and only suffer want… a generous person will be enriched, those who help others will be helped.” Boom. Short and sweet. To the point. Would you say that is true of your life? In giving freely, do you grow more fulfilled? In withholding, do you end up only wanting more? The writer says bluntly, you want to measure an effective life? What do you give away? How do you help others? Are you more concerned with getting yours, being selfish, or living in gratitude and doing good for the world? Seems pretty straightforward and I think most of us would say, at least in church, that we agree with the notion, “It is better to give than receive.” But is that truly how we see success? Or do we live as if control and power and money and more of it is what determines success? There was a man who gave millions to establish a university in Texas. Several years later, he lost everything. Someone asked if he had regretted all he had given to the university. “Regret it?” he said, “That school is the only lasting thing I’ve done with my money. Had I not given that money, I would have lost it too.” What have you given of yourself to… what place, what cause, what hope… that is about a lasting impact? Gratitude is about living with open hands to the world. When we clench our fists or hold tight to our possessions or our time or our gifts of ability to some cause to improve the world, we close the door on gratitude. We are, in turn, not changed for the better. We’re not happier. And we just get lost in the fear of scarcity. As if there’s not enough stuff to go around. Not enough money. Not enough, not enough, not enough. How often is that our driving concern? A friend shared with me this week his experience of the past weekend. He wandered into an Estate Sale and was a bit taken aback by the whole experience. People were rushing in to claim the material goods of another now deceased… a houseful of things that stood as a reminder of one’s property, possessions, personality and likes. My friend stood back as others were aggressive in the hunt for steals and deals and a couple of those working the sale said in observance of the look on his face. “Look at him, he’s soaking it all in, creating a plan for what he wants to get.” My friend, still a bit stunned by the whole thing, asks the two working the sale, “Did you know the person who lived here?” “Uh, no,” they said. “Do you know their name?” “Um. No, guess I don’t… but they sure had some great stuff.” We work hard to accumulate a life without taking much time to truly live a life. Writer of proverbs is saying, “You want your world to expand? Not with riches but with what truly is a rich life? Then live generously. Lead and make room for others to lead. Give and model for others what generosity looks like. Loosen the grip on your possessions and see what that affords your spirit to possess anew.” Sometimes, it is our comfort that makes us lose sight of the generous life. We become consumed by mundane things that are not kingdom game changers. In the movie Old School (not a pulpit-endorsement mind you) Will Ferrell plays a married, thirty-something-year-old suburban man who finds himself at a college party. When he’s offered a drink, he declines, saying, “I have a big day tomorrow.” When he’s asked, “Doing what?” he responds, “Well, um… actually a pretty nice little Saturday. We’re gonna go to Home Depot, buy some wallpaper, maybe get some flooring, stuff like that. Maybe Bed, Bath & Beyond… I don’t know. I don’t know if we’ll have enough time…”. As you can imagine, not overly relatable to a college aged crowd but why do people who have seen this movie remember this line? Will knows how to deliver a line, yes, but more than that, there’s something more going on than his trip to Home Depot on a Saturday. The man in this movie is bored. He has the life that is often portrayed as the ideal – a spouse, a house, a job, security, comfort, privilege, freedom – and yet it’s left him bored, numb, and in a low-grade state of despair. His ‘success’ has actually served to distract him from just how deeply unsatisfied he is with his life. Have you ever experienced this sort of life… or maybe know someone who has? It can create a paralyzing indifference that comes from being too comfortable. What Rob Bell calls, “Death by wallpaper and flooring.” Happiness does not exist solely in wallpaper and flooring… even if you’re an interior designer. Our behaviors have to move us beyond that comfort… over the edge of easy, comfortable, existence to a life that places gratitude, generosity, and difference-making as our top behaviors. 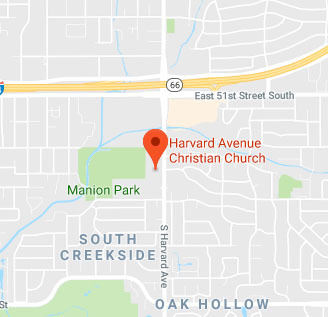 2018 has been a year of this sort of behavior at Harvard Avenue Christian Church. We’re growing as a church by most every measure. At a gathering of those newer to the congregation last Sunday, there was an eagerness for Bible Study and understanding of our movement of faith known as the Christian Church (Disciples of Christ). A Bible 101 course and a series about who we are collectively as Disciples and who we are as disciples at Harvard Avenue will be new opportunities in 2019. We had 448 people join us to worship God last Sunday morning. I remember a decade ago being here on a Sunday morning with as few as 140 faithful. Those are just numbers but they represent a hunger and passion for faith… to do something counter-cultural… to invest in the spirit. During the state-wide teacher walk out this Spring, you rallied to be a host site for school children during those important two weeks. You made meals for teachers marching from Tulsa to the capitol and delivered them wherever the walk ended that particular night. You treated and cared for the educators of our own congregation that season… it was an inspiring time. In more recent weeks, 100 volunteers stepped forward to host homeless neighbors at the church for a week and we’ll do so again just before Christmas. Ashley Pease created and hosted a Spotlight Theater Camp for kids this past summer that will surely grow in its second attempt next summer. We experienced the gifts of that camp on Sunday Funday – one of the most joyous worship experiences I’ve ever been a part of – where 22 people stepped forward at the end of worship to profess faith in Jesus and join our congregation in the mission and vision we share. There were mission trips and fellowship gatherings and the world’s leading pickleball player present to lead a clinic at our church. As a church, we gave almost $30,000 in special offerings to Week of Compassion alone – a denominational ministry that is the first to respond to natural disaster needs in the world. This week, leaders of Week of Compassion are coming to our church from around the country for their bi-annual meeting… to be on the turf of a congregation who has given more in special offerings to serve this ministry than any congregation in the United States and Canada for several years running. You have given freely, and we are growing in faith, in number, and in spirit because of it. Kevin, Courtney and I were on a prayer and planning retreat a week ago with pages of prayer requests from you that we took humbly and intentionally before God in prayer. As you poured out your hearts, we poured out those requests before God and continued to find the word “wholeness” surface as a quest of our congregation. How can we be a movement for wholeness in our very fragmented world? That seems to be the hunger of our community so we’re working to shape 2019 around that need and desire and I believe it will be a deeply meaningful journey… if you’re up for it. If you’ll invest time and energy, spirit and resources to help us find God’s loving challenge and encouragement in faith. If we all do our part… give our best… invest intentionally in the communal effort, I believe the transformation will not only be visible to us all, but it will be an inspiration to our city. Carrie and I will be prayerfully completed our pledge card this week and bringing it to worship next week on Thanksgiving Sunday. Will you join us in that? Your pledge to the church helps determine our reach in 2019 – what programs we can offer, what new needs we can meet, what worship experiences, studies, retreats we can create, who we can serve more fully, what witness we can make in Tulsa and beyond. You may think that your contribution of time, talent and resources isn’t as valuable as another’s, but I’ll politely disagree. You give. You trust. You grow. Chris Martin, lead singer of the band Coldplay once said: “I can’t dance like Usher. I can’t sing like Beyoncé. I can’t write songs like Elton John. But we can do the best with what we’ve got. And so that’s what we do. We just go for it.” What are you ready to go for? How can you be grateful in a new way? How can your generosity expand to a new level? Proverbs says a generous person will be enriched. Your 40% control over your behaviors may make all the difference. Can you imagine your satisfaction – physically, emotionally, spiritually, improving by 40% next year? We can, at minimum, take a step in that direction. And practicing gratitude is the best place to start. If you’re grateful and you know it clap your hands. If you’re grateful and you know it clap your hands. If you’re grateful and you know it then your life will surely show it. If you’re grateful and you know it, clap your hands. https://www.njlifehacks.com/thanks-robert-emmons-book-summary/ Info shared in this message concerning Emmons work are found at this link. This quote and the Old School reference found in Bell’s “Drops Like Stars.” Harper One. 2009. Pg 41-42. Researchers have noted that positive emotions wear off quickly. Dr. Robert Emmons suggests that our emotional systems like newness. They like novelty. They like change. We adapt to positive life circumstances so that before too long, the new car, the new relationship, the new house doesn’t feel so new and exciting anymore. Gratitude, however, makes us appreciate the value of something. Valuing something presses beyond emotion and allows us to extract more benefits from it without us taking it for granted. Gratitude propels us to participate more fully in our lives. We become more present to the small things, the moments of grace and beauty that we may have previously overlooked. We become participants in the world, not simply spectators. Jesus once healed a group of ten people suffering with leprosy. Only one felt value enough in the healing to stop, be present to the moment, and say thank you. He was alive in a new way. If your life was a microphone and you tapped the top of it, would it be on? October 31st. Halloween found us last week. Did you see any interesting critters running around your neighborhood? We had a gob in our neighborhood. Here are a couple that wound up in my house … plus our dog, Taylor, that is, yes, wearing a jack-o-lantern skirt. We’re now that family. You know, the one that dresses up their dog in human-like attire. Do you see the terror on her face? 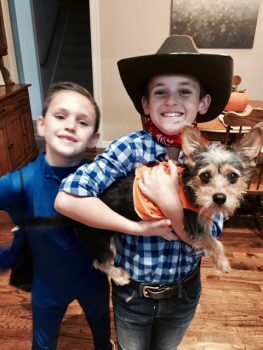 Trick or Treating must be among the cruelest, albeit exhilarating, experiences for dogs. Every ring of the doorbell, results in this breathless sprint to the door, leaping up into the door windows, barking excessively at the largest turtles and dinosaurs she has ever laid eyes on. By the time her blood pressure drops from one visit, the doorbell rings and we re-play the same thing all over again. All in all, good fun, however. The candy is gluttonous. I do enjoy those tiny boxes of Milk Duds and a good Reese’s Cup. I saw this picture posted this week. 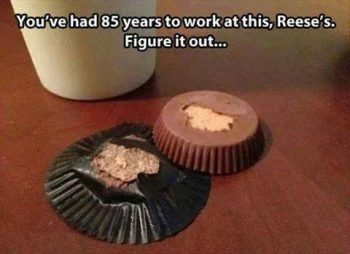 If you can’t read the text it says, “You’ve had 85 years to work at this, Reese’s. Figure it out…” Of course, if you’re a veteran Reese’s fan, you know you never eat them right away. You put them in the freezer. Once frozen, they always peel off the paper clean and the joy is overflowing. We found our way house to house in the neighborhood, a little chill and a rain surely contributed to me having zero voice when I woke up Thursday morning… still coming back bit by bit now. Before it was gone, I was among the many parents who had the talk with their kids before getting started. “Be gracious, boys. “Don’t be greedy. Be kind and polite and engage our neighbors.” And, of course, as every parent has done for generations, I closed with, “And when our neighbors give you something, what do you say?” THANK YOU! Thank you is one of the first things we learn to say as humans. By far one of the most commonly used phrases in the English language. The average American says, “Thank you,” 2,000 times a year. Research suggests, however, that more than half of the time, we don’t mean it. It is simply transitional speech – ending an encounter – more so than taking to heart the gratitude we are theoretically to feel in such a time. What is gratitude then? Science even ways in on the matter. Dr. Robert Emmons, a leading scientific expert on gratitude, argues that there are two key parts to gratitude. First, gratitude is an affirmation of goodness. We affirm that there are good things in the world, gifts and benefits we’ve received. Second, we recognize that the source of this goodness is outside of ourselves. As people of faith, we point to God as our source of “every good and perfect gift” and that “all things work together for good” when God’s love is at the center of the effort. Gratitude. How are you doing with gratitude these days? Such will be the focus of our three-week stewardship series grounded in the practice of gratitude and filtered through this idea of the “Open Mic.” I’m grateful for Staci’s testimony this morning and look forward to others that will follow in the next couple of weeks. The hope of this series is for you to think of your very life as an Open Mic. You have a voice; you have a stage; you have an audience; no matter who you are. If you’ve ever been a roadie for a band or set up a sound system for some event, there’s always that moment when you check all the wires to ensure they are properly connected, you turn up the volume to ensure the channel is open and live, and then you walk up to that mic, tap the top of it and say, “Is this thing on?” That’s what we want to know about your life, and mine, as part of this series – Is your life, you own personal open mic, is it on? If so, what are you saying? Is your voice focused on a judgmental rant? Are you spewing challenge or encouragement? What? And perhaps most poignantly, are you a voice of gratitude in our polarized and hurting world? Jesus had more than a few thoughts about what our lives should say to the world. Gratitude was near the top. On one occasion, as Jesus was making his way toward Jerusalem, he crossed over the border between Samaria and Galilee. As he entered the village, ten men suffering from leprosy hollered at Jesus from a distance. It was customary for them to keep their distance as those with leprosy were among those deemed, “unclean.” If you were considered unclean, you were exiled from your home, your family, the whole community. Levitical law prescribed this reality. “Don’t bring your issues and diseases to the rest of us!” sort of idea. While the distance was not always defined, at least one authority laid it down that the unclean person was responsible for knowing the direction of the wind. If a healthy person was downwind from one considered unclean, the person with leprosy, in this case, would have to stand at least fifty yards away. Nothing could better show the utter isolation in which the “unclean” had to live. So here are ten who are with an unclean condition, tasked to be meteorologists in order to determine where they could exist, or not, at any given moment in relation to the community. Presumably most of the ten are Jewish though we know at least one is said to be a foreigner, a Samaritan. We know that the Jews and Samaritans avoided each other at all costs. They funded negative campaign ads against each other that were plastered all over television and social media. “That Samaritan stole the full-size candy bars out of his kid’s Halloween candy basket. If he’ll steal from his own children, can you imagine what he’ll steal from the rest of us?” The comebacks were just the same, “He’s a left-handed guitar player with two first names – is that really the kind of guy we want making decisions about insurance in our county?” You get the point. They didn’t get along. At all. Yet in this band of ten, there was at least one Samaritan. A common misfortune had broken down the racial and national barriers. In the common suffering of their leprosy, they had forgotten they were Jews and Samaritans and remembered only they were humans who were more alike than not. Surely one of the things that should draw all humanity together is a common need of God… whose very nature is love itself. But… we are often too consumed with our own issues, needs, desires to stop long enough to see another as more like us than not. I sat in my car one day this week, a friend in the passenger seat, out behind the church as we waited on another to join us. We had just learned of the death a close friend had experienced and we were mostly sitting in silence. Looking ahead of us at the playground however, there were tons of kids running and laughing and playing. We just sort of sat there silently and took in the sight. I finally broke the silence saying simply, “And the world plays on.” You never know, as you move about your daily agenda, who’s life has come to a screeching halt. It never hurts to put ourselves in the shoes of another from time to time. But for these ten? Not many giving them the time of day. Every day was a dead end… a screeching halt of a life. Enter Jesus. The ten holler at him, heaving a Hail Mary of “have mercy on us” from the fifty-yard line toward Jesus in hopes that the pass may somehow, miraculously, be completed. It’s never worked to this point. But… Jesus “saw them.” Those three words may be sermon enough for today. Jesus saw them. Who do you need to see? Jesus saw them and with compassion says, “Go show yourselves to the priests.” May seem like an odd thing to say to you and me but in that time, if a person with leprosy was fortunate enough to experience healing, that person was required to show him/herself to a priest. Only a priest could certify that a person was truly clean and therefore able to return to the community. The ten take off for the temple but along the way, they are healed. Presumably they all realize this at some point but only one of the ten has the thought pop into his soul – “I’m going back to Jesus!” The other nine continue the beeline to the priest. After all, that was the instruction they were given anyway. Just following orders. And… they couldn’t see their families or go to Whataburger until the priest cleared them to re-enter society as a clean human being. If you had found freedom after being shunned for years, what would you do? There was one who went back. Jesus is clear to say it is the Samaritan (you may read as the democrat or republican or Immigrant or Texan… whoever is not in your camp). It is the Samaritan who goes back and throws himself at the feet of Jesus… the first person other than the other nine that he has been face to face with for who knows how long. College students were asked to fill out a weekly report of five things for which they were grateful. They listed things like “the generosity of friends” and “the Rolling Stones.” Another group, made up of adults with incurable diseases such as polio, were asked to write down a list of things that made them thankful. At the same time, comparable groups were asked to count their hassles and frustrations instead. They listed aggravations such as “hard to find parking” (isn’t’ that the worst?) and “finances depleting quickly.” Instead of focusing on how rich they were, members of these groups focused on their poverty. You already know the results. In the end, the grateful groups felt better about their lives and more optimistic about the future. The thankful college students exercised more, and the chronically ill adults who focused on blessings reported sleeping longer and waking up refreshed. The members of the grateful groups were also nicer to neighbors and more willing to help people with personal problems, leading the researchers to conclude that gratitude can serve as a “moral motivator.” “Your faith has made you well,” says Jesus to returning Samaritan. Jesus gives him a high five not so much for the faith that asked for healing, but for the faith that returned to give thanks. It’s a grateful faith, not a gimme faith, that saves us… that makes us well. Eugene Peterson, now a week into the resurrection, said, “There is a great market for religious experience [or healing] in our world; there is little enthusiasm for the patient acquisition of virtue, little inclination to sign up for a long apprenticeship in what earlier generations of Christians called holiness.” Gratitude, not practiced as a discipline, puts us at risk of a life drowning in selfishness. We have to choose gratitude until we are grateful. It’s a discipline. You write it down. You say it. You think it. You feel it. You breathe it. Eventually, gratitude becomes the lens through which you see the world. I was convicted the other day seeing this image of Staff Sergeant Johnny Jones with his quote that reads, “People ask how I stay so positive after losing my legs. I simply ask how they stay so negative with theirs.” I’m not one who is into comparisons because that just sets us up as competitors – “My sickness is worse than yours. My life is harder than yours. My bank account is not okay until it has more in it than yours.” Comparative living is not generally helpful. But when I experience positive people… who may not be healed but are well… I am inspired to practice gratitude more intentionally. So often, however, when we get what we want, we never come back. How often have we been the nine, instead of the one who comes back to praise God? Until we practice gratitude… allowing it to become a part of us… we will never be well in the way Jesus proclaims the grateful Samaritan to be. So today is ours… this moment at least, all we are promised. Will gratitude lead the way? Do you want to be well? Your life is an open mic. The mic is yours. What will you say? https://www.njlifehacks.com/thanks-robert-emmons-book-summary/. Dr. Emmons research and findings included in this message come from this source as well as others where he says similar things. Exegetical support found in William Barclay’s “Commentary on the Book of Luke.” Westminster Press. 1975. Brown, David. “Counting blessings is healthful.” The Washington Post, March 10, 2003, A11. I saw this quote and picture on a Facebook post of a friend some time ago. I do not know the original source.